A rustic and electricity-free hot spring resort outside of McCall. Perfect. Three years ago I was unemployed, my wife had just left me out of the blue, and my dog Luna was showing signs that her cruciate tendon was giving way, requiring her second surgery. She couldn't walk. My world was on fire and I desperately needed a escape, even if it was for just a weekend. That distraction came in Idaho. Months earlier I had registered for the beasty IMTUF 100 trail race. While my spirits were crushed from the recent tailspin and my body was undertrained, I decided to catch a ride with my friend, Nick, who was registered as well. "I need this for me" I thought. Nick and I met in Tacoma and started the long, winding eight-hour drive through Washington and Idaho to Burgdorf Hot Springs, a rustic retreat just outside of McCall. On race morning the first 25 miles on trail flew by. The second marathon included water crossings where my feet became bloated and worn down by the "moon dust"—silt piled high on the single track trail. I ended up getting a severe case of swamp foot and DNF'd at mile 52, just before the climb up Snow Slide. I failed. I was a failure. That's at least how I felt on the drive home to Seattle with Nick. My spirits were crushed, but I was at least grateful for the miles with friends and sights on the trail. It was nice to get out of the house and put my thoughts on something other than the weight I was shouldering. Within two weeks I started my new job. Whew. Over the next three years I healed, grew, loved and ran. Luna got her surgery and healed up 100%. I built the life that I desired and found new adventures—tough ones, too. I ran around Mt. 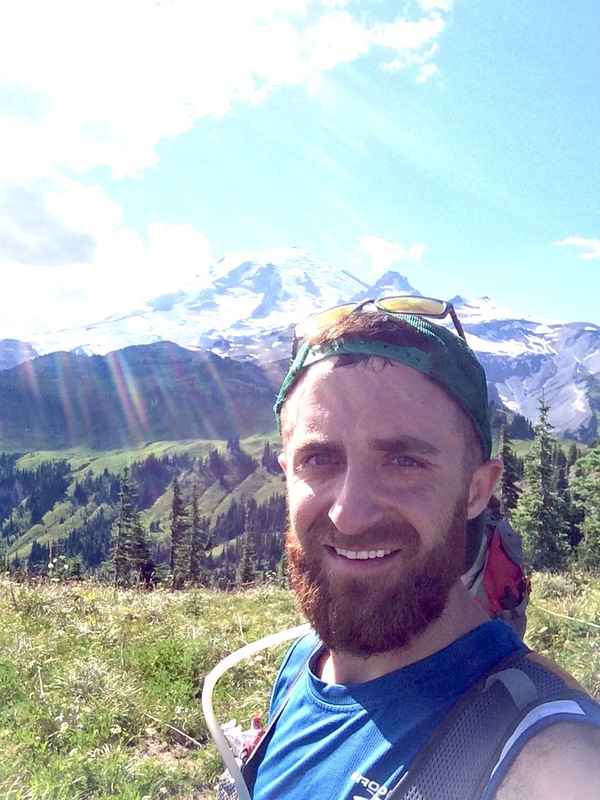 Rainier on the Wonderland Trail, set a new PR at Beacon Rock 50K, and even participated in the first-ever Mt. 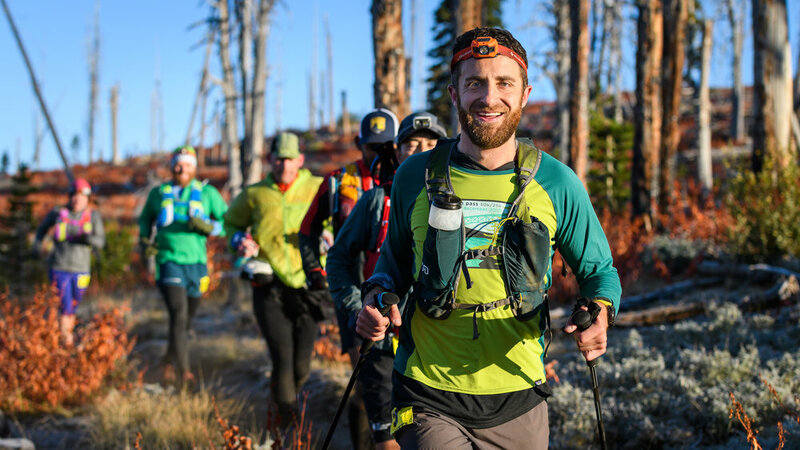 Baker Ultra, a 50-mile run from Concrete, Wa to a summit of Baker and back. 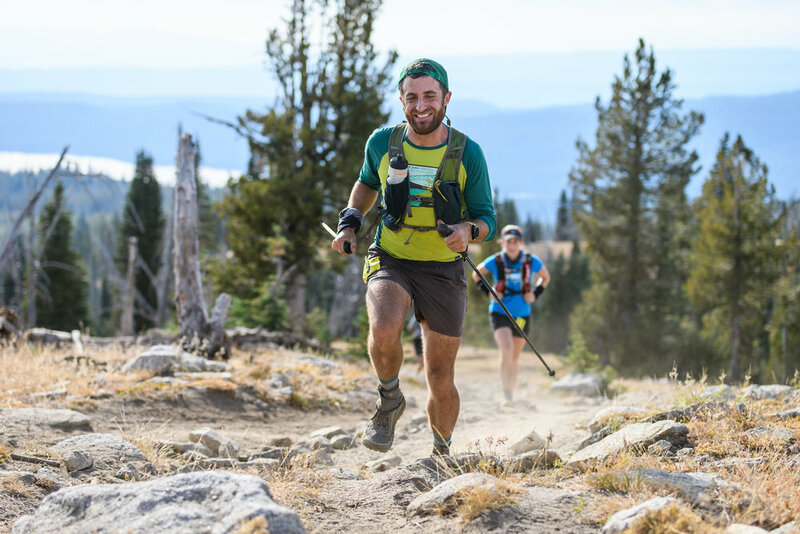 After deferring my IMTUF race entry in 2016 due to a poor run at White River 50, I signed up for this Idaho challenge again in early January of this year. I had no idea where life would take me over the next nine months, but I felt like I needed to give that run a try once more. I needed an ending to my story, no matter what it said. September came around faster than I thought, and in a flash I found myself back at Burgdorf last Friday. While I hadn't ramped up my training like I normally would for a 100, I was healthy and in an entirely different place than I was back in 2014—a stronger place. When I arrived at the hot springs and stepped out of my rented minivan I surprised to need a long sleeve so early in the evening. It was cold, but I saw friendly faces which calmed my nerves. The Seattle crew was in full force: Ben, Sudheer, Ely, Kaytlyn, and Katherine, and Linda from Vancouver. While the weather was cooler than I remembered, I had brought gear that I hoped would get me through the night. At the race briefing the co-director Jeremy Humphrey warned us to descend the technical terrain slowly, else we'd need "Kilian [Jornet] skills, or pay hospital bills". After a quick dip with lovely Colorado peeps in the boiling Burgdorf pools, I retired to my minivan and called it a night. Tomorrow my future would be written. Or I guess, the next, next day. On race morning I felt neither strong nor weak. I was just present. At 6 am, the race director Jeremey gave the signal and we headed out into the darkness. The air was freezing, but we moved swiftly, climbing up the ridge. My plan was to take the race ten miles at a time. I wouldn't worry about the finish. I planned to run from aid station to aid station. Patience, combined with quality wool and poly blend socks packed in drop bags would get me there. At each aid, I'd then change socks, power my feet with talc if they got wet and manage my aches and bumps one step at a time. This was how I would combat the challenges I faced three years earlier. Saving you from all the play-by-play over the next 98 miles, I'm choosing just a few moments to share. I'm doing surprisingly well. My body didn't hurt despite running at elevation and navigating what were previously described as gruesome obstacles like the Terrible Terrance Trail, a connector stretch of loosely defined rock and dirt connecting two proper trails. I felt fine as I climbed up past 7,500'. Frosty trees and a cloud bank far below. Everyone just stopped, pulled out a camera if they were carrying one and captured the stunning view. Nearly halfway done, I was proud of how I managed my clothing and nutrition and was prepared for a cold night. However I knew the next 11 miles would be a tough stretch. I climbed with other runners into the darkness, up, up and up for what felt like 10,000 ft into the sky on extremely rocky and wandering trail. The true ascent was only about 2,000' but we topped out at 7,800 in the deepest of night. The descent down to the Snow Slide Aid Station was nearly as difficult as the climb up. I even found a runner from St. Louis who was turned around, confused by a marker above and below. Eventually I made it down. Snow Slide was the very place that I had failed three year earlier. That stretch of trail took a lot more than I expected, but I arrived with a spirit of defiance. I made it. At this point we were deep into the night and my biggest challenge wasn't exhaustion, injury or busted feet. My malady was something more domestic: I was sleepy! Not exhausted. I still had the will and power to go on. I just couldn't stop yawning and my eyes weighed a ton. After taking a few steps, my eyelids would slide shut and I'd stumble off the trail. Coffee, 'No Doze' and food did nothing to shake me awake. Crap! I ended up taking three or four micro-naps at aid stations over the next 10-15 miles. I'd lay in the heating tent and close my eyes for five or six minutes just to try to get past the sleepies and yawnies. After these micro-naps, I'd stumble on to the next aid and repeat. It was only the light of the morning that woke me awake with any permanently. Now daybreak, it was at this time that I did the math and didn't think I'd be able to make the cut-off at Chinook at mile 86.3. I grappled with that reality for miles and came into Victor Creek Aid Station at mile 77.4 grumpy and defeated. I wasn't entirely broken, but I wasn't 100% either. I would soon have to make a decision on my future. Dark thoughts crept in. "Would I fail again?" I thought. "Would I embarrass myself in the eyes of friends and family?" I soldiered on and walked/trekked to Willow Basket Aid Station at mile 83. When I arrived I had yet to make a decision on whether to try to make the Chinook cut-off of 12:45pm or not, 2.9 miles away. The wonderful volunteer helped me with food and water. "Can I make it?" I asked her in a frustrated tone. "If you run... maybe." she replied honestly. ...and so I RAN. I ran hard. I did some Forest Gump-style bolting. The sun was out and I pushed up and around the valley, watching my milage and time. I knew it would be VERY close to making it to the aid station under the cut-off so I did everything I could to speed down the trail. For the first time in the race I put on tunes—Kanye—and tried to navigate the silty single-track while searching with my eyes for what looked like a check point. I passed tourists who gave me beta. "About a mile away!" they shouted. I continued to push, turn switchbacks and speed up and down trails. Finally I saw the aid station, and checked my watch. It read Sunday, 12:30pm—15 minutes before the cutoff. Volunteer Matt Stebbins helped me with my pack and provided me with food and water. I felt like I was almost back to Burgdorf. However, I had calculated the milage incorrectly. I thought I had a mere ten miles left. Matt corrected me. "You have 17 miles." While I made it to the aid before the cutoff, I now had to solider the energy to make it back to the hot springs. I harnessed my anger, frustration and disappointment to push down the trail. I now ran hard not because I HAD to, but because I was angry at the anthropomorphized-race. I hated it. And so I ran. We had to make a MINDLESS loop, grab an "x" on our bib with a marker, and then run back to the last aid. Joel = not a fan. Working my another runner, Jenny from Mammoth Lakes, CA, she and I climbed up through the valley up to Loon Lake, an entirely unnecessary out-and-loop-and-back where we had to mark our bibs with a special red marker to show we did the full milage. We then heading back to the Willow Basket Aid Station. After a quick snack I headed out with a pack of six runners the last ten miles, climbing up and out of the wilderness. Feeling powerful, I pushed to the front of the group, and eventually sped forward alone. At this point, I was incensed. I was going to punish my legs and give it all I could, or fail trying. I had about three hours to do the ten miles. It was doable, but I didn't want to lave anything up to chance. I climbed up on fire roads and ran down with intent. Eventually I made it to the Ruby Meadows Trailhead at mile 100.8, and connected with humanity again at the road. The last two miles were on road. Trucks and cars passed and cheered us on. Some were race volunteers or family. Others seemed to be just visitors to the area who recognized something special was happening. The beasts made had made it through the darkness. As I ran the last mile, my form tightened and I got a little emotional. I started to choke up. The feelings were flowing not for any one reason. I just needed to "feel" for a second. No tears came, but I felt quivers of emotions. I passed the finish in 76th place, just an hour and quarter before the 36-hour cutoff. Of the 127 runners who started, 86 finished and 41 did not make it past the cutoffs or chose to drop, a DNF rate of 47%. Probably a common percentage for a Hardrock-qualifier of this caliber. Surprisingly I wasn't hungry or hurt after the race. My little toes on each foot were worn into blisters, but other than that I was feeling fine. After a bath in the hot spring tub, I changed clothes, drank a beer, expressed my gratitude to the race directors Brandi and Jeremy, and then drove down to Boise making it to 10 Barrel Brewing by 9:45pm for dinner. It's back to the real world. IMTUF 100 took me three years, 34:46:27 to complete. I am eternally grateful to the race directors Brandi and Jeremy, to the dozens of volunteers who sacrificed so much, to the sweeps who cleared the course, and to the neighbors who cheered on these mutants who visit annually to see just how TUF they really are. Nailed it! My first 100 finish in four years. It didn't hurt. It hurt. And then it didn't matter.